Udupi, June 28,2017: In the wake of the turbulence still in force from the iftar meet organized by Pejawar seer at Udupi Sri Krishna mutt, an organization of Muslim social workers in Dakshina Kannada district on June 27, Tuesday held a Eid get together at a Koragacolony. M-Friends, an organization of Muslim social workers and entrepreneurs, held Eid meet at Mangalapadavu Koragacolony in Vittal, 40 kms from the city. The programme held at the house of Manku Koraga began with a Tulu paddana sung by Koraga community members. Visually challenged Seetharama, a member of Koraga community, mesmerized the gathering with his singing. 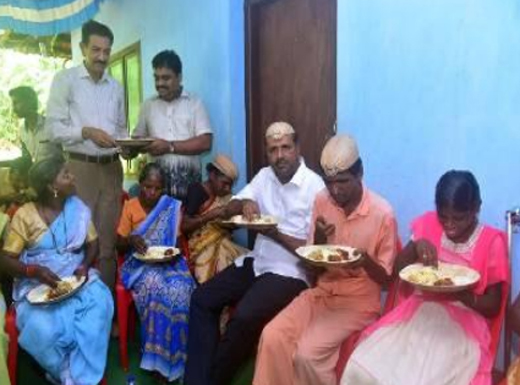 Participation of minister for food, civil supplies U T Khader, also a member of M-Friends, raised hopes for 13 Koraga families and five Adi Dravida families residing in the colony. Khader took an initiative to find solutions to some of the problems being faced by the tribal families. He directed the Mescom officials to provide power supply to two houses in the colony immediately after his attention was drawn towards the problem. He also offered to provide funds for construction of toilet for a family. As a token of appreciation, the tribal community members offered Khader a ’Muttale’, a traditional cap made using areca leaves. Later, Khader and M-Friends members had lunch with the colony residents. Khader said there is happiness in celebrating festivals with economically weaker sections of the society. "Islam mandates that one should not discriminate people in the name of caste and religion. Pejavar seer Vishwesha Thirtha Swami has shown the world what harmony is by holding an iftar meet at Sri Krishna Mutt premises. The noble initiative of the seer will inspire many to live in harmony," Khader said. M-Friends secretary Rasheed Vitla is reported to have told media that the original inhabitants of coastal district. "Koragas, who weave baskets to earn livelihood, are a hardworking community and it is always a joy to spend time with them. There is no disparity in Islam and it emphasizes on equality. We believe in unity and harmony in the society. Hence, there is the need to hold harmony meet at the colony and direct those (Koragas) to the mainstream and betterment.